Tubercle on the surface of a copper tube (corrosion by type I pits in sanitary cold water). Pitting corrosion on the wall of an Cr18-Ni10 austenitic stainless steel tank. Pitting corrosion is particularly insidious. 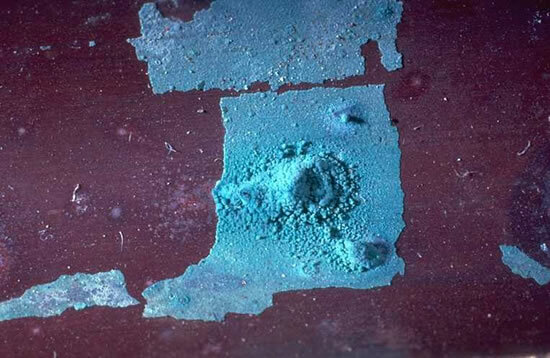 The attack is in the form of highly localized holes that can penetrate inwards extremely rapidly, while the rest of the surface remains intact. A component can be perforated in a few days with no appreciable loss in weight on the structure as a whole. Pitting corrosion is most aggressive in solutions containing chloride, bromide or hypochlorite ions. Iodides and fluorides are much less harmful. The presence of sulfides and H2S enhances pitting corrosion, and systematically impairs the resistance criteria for this type of attack. The thiosulphate species plays a similar role, since its electrochemical reduction causes "sulphidation" of the exposed metallic surfaces. The presence of an oxydizing cation (Fe+3, Cu+2, Hg+2, etc.) enables the formation of pits even in the absence of oxygen. However, in the presence of oxygen, all chlorides become dangerous, and this is also true in the presence of hydrogen peroxide. 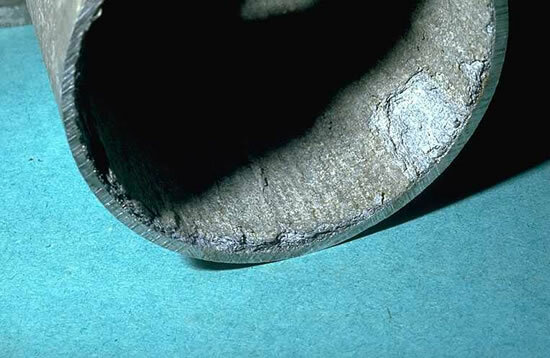 The stainless steels are particularly sensitive to pitting corrosion, but other metals, such as passive iron, chromium, cobalt, aluminium, copper and their alloys are also prone to this form of damage. Very often, in non-passivatable metals, a "tubercular" surface morphology is observed, beneath which pits develop. 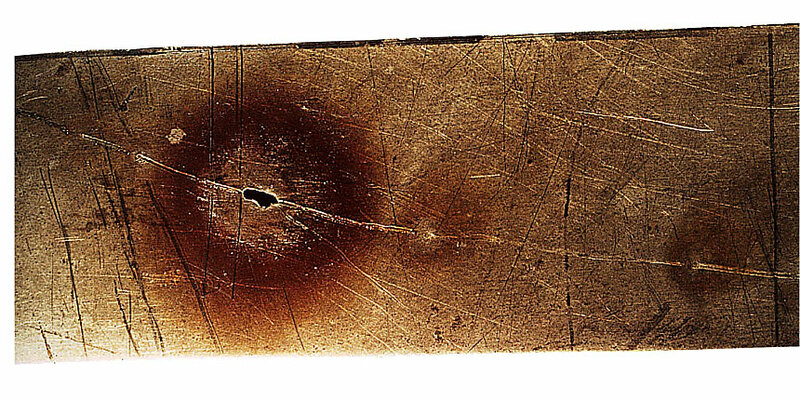 Contrary to crevice corrosion, the cause of pitting is not always completely local in nature. Thus, although alterations or intrinsic defects at the metal-solution interface (e.g. inclusions emerging through the passive film in stainless steels) often represent nuclei for local dissolution, all such potential nuclei are not attacked. The stabilization and development of these nuclei always show a random nature. Galvanic coupling is then established between the discontinuous zones, which form small anodes where metal dissolution occurs, and the remainder of the surface where the cathodic reaction takes place. Means of reducing or preventing pitting corrosion : Choose the material most appropriate for the service conditions, avoid stagnant zones and deposits, Reduce the aggressivity of the medium, use cathodic protection.